The Dressage Way illustrates the transformation of the human by virtue of the eminently noble creature: the horse. This book is neither a simple how-to manual nor a staunch treatise on the benefits of dressage for horse and rider. 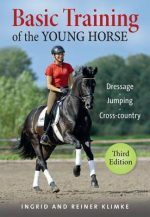 With classical dressage as both foundation and inspiration, this collection of essays traces the path of the dressage trainer as she grows through her experiences with the horse. In section one, “The Way of Dressage,” we see the trainer as a keen observer. She describes seemingly endless ways to understand this complex creature and in turn, herself. Section two, “The Way to Dressage,” is a guide. The path has become clearer, more distinct, and all questions have been answered. There is no looking back – only forward, and to what? In third section, “The Way is Dressage” the trainer has come to the revelation that dressage provides a “way” in and of itself. The beauty of this “way” is that the horse and human are no longer separate entities but have become particularly joined so as to become yet a third,single entity. This possibility of dressage is rarely realized and even more rarely written about. In this volume a type of universal language is used, one comprehensible to both horse and human. And it is this inclusion of both that leads to the growth of each. This is the only way. “Go forward, be round” is a philosophy frequently heard at Hermitage Dressage, Winchester, Wisconsin. Expressing the essence of the classical ideals of riding, this phrase has become the signature of Susan Medenica’s training and instruction. Susan Medenica has worked with a wide variety of students and horses over the years, always striving to expand the unique talents of each. Whether starting the novice horse or rider or polishing the more advanced, the integration of one with the other is always the guiding principle.